What’s Better than a Fun Game for Kids? A Fun Game with a Cuddly Puppy! BELOIT, Wis. (July 27, 2018) — PlayMonster LLC is happy to welcome a fluffy puppy to the family…in the form of a new game for young children, Pass the Pup™! Not only is the pup adorable, he’s also musical! Children begin the game by sitting in a circle, squeezing the pup’s paw, and then passing him around as the music plays. When the music stops, the dog will howl, and the person holding him then has to draw one of the cards. The card will tell the player to act like a dog in some way, like bark, scratch or roll over. This way, it’s fun to be the one holding the pup when the music stops, instead of being “out.” They also learn a little bit about dog behavior from the cards! It’s a fun game for playtime, parties, daycares and more! Plus, after the game, the pup can be a soft, huggable friend for playing or napping! Parents will love that he’s easier to care for than a live pet! 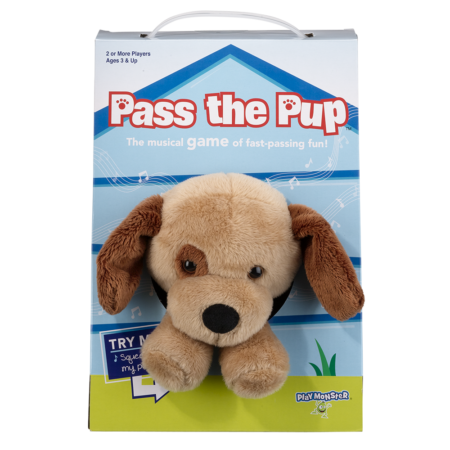 Pass the Pup retails for $17.99 and is designed for 2 or more players, ages 3 and up.